I'm really cutting it close with my homework for these MFT Summer School Challenges...just like a real college student. LOL. This is my homework for the complementary colors lesson. I didn't realize before this lesson that red and green were complementary colors! I had a bit of an epiphany moment, so even though it's 90+ degrees outside, I decided to make a Christmas card. 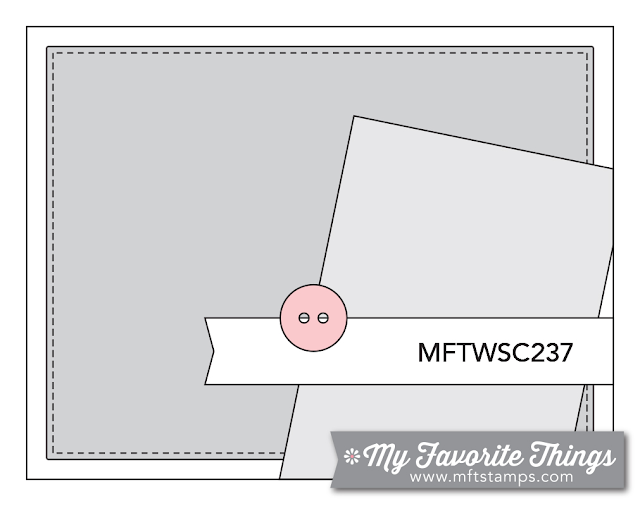 I love MFT's stitched scallop borders! I've been using them a lot! I paired it with this gorgeous sentiment stamp from Grand Holiday Greetings and the card came together so quickly, I had enough time to complete the last lesson. The only lesson I hadn't completed was the gallon, quart, pint color lesson. This color theory suggests that one of the best ways to pair 3 colors is a lot of one color (a gallon) and good sized amount of the second color (quart) and a teensy bit of the third color (pint). Am I the only one thinking about chocolate milk right now? mmm. LOL. Here is my homework. A couple of weeks ago Elaine Hughes, aka Marker Geek, posted a tutorial for creating a swirly night time sky with copic markers. I don't have copics, but I thought the galaxy technique looked neat, so I tried it out using a handful of prismacolor markers. This is the result. 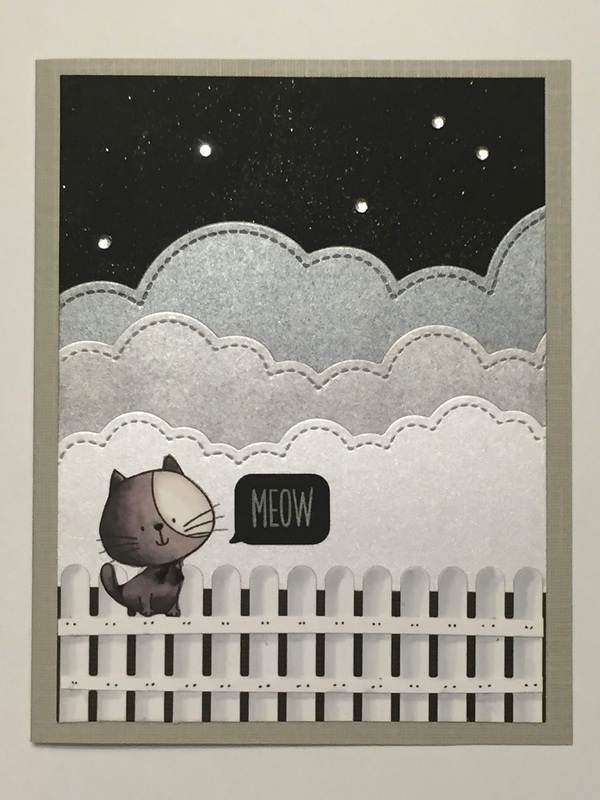 My night sky still looks a little blotchy, but I was sort of feeling out my color choices as I went. I added a bit of glitter, to distract from the splotchiness and also because, well...glitter. Do you really need a reason? Ultimately, I thought it was a super fun technique, and I'll definitely try it again. Thanks for posting the tutorial so I could try it out, Elaine! 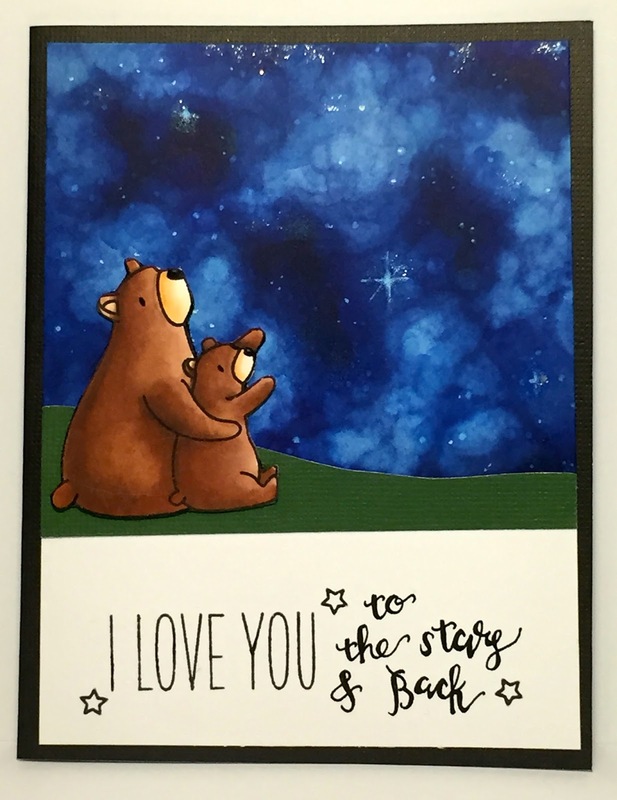 I added these cutie pie bears from Mama Elephant and ended up with this little scene. I'm entering the card in 7 Kids College Fund Challenge, which is anything goes and the Simon Says Stamp Challenge which is Sparkle and Shine. Keeping with the theme of the card, the inside sentiment says, "Sending you a love song." That's it for me this evening! Thanks for stopping by. My Favorite things is teaching another summer session (each lesson focuses on a different color theory). One of the lessons is about primary colors. I find primary colors a little bit intimidating, but Torico had some really great tips on her blog. She walked us through the thought process she used to make her card, which I found really helpful. 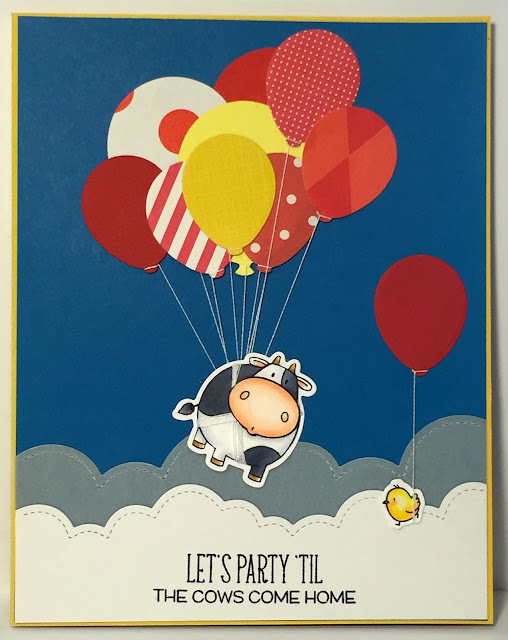 I used a similar process for this card. I tried to think of a theme that would make the most of the primary colors, and I decided to "go country." 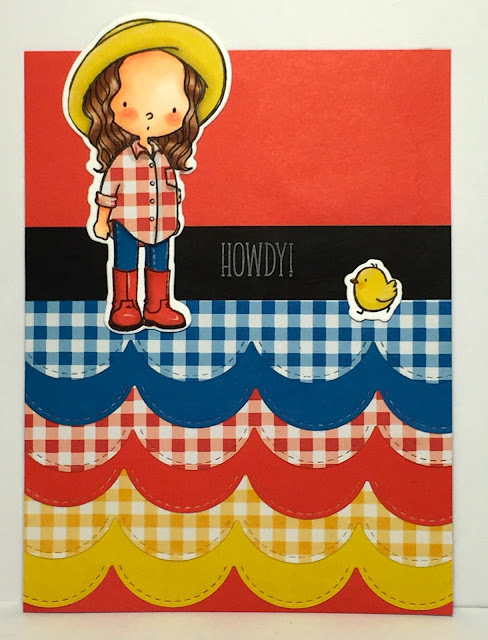 AND... what says country better than cowgirls, chickens, and gingham?! From there, the card came together quickly. 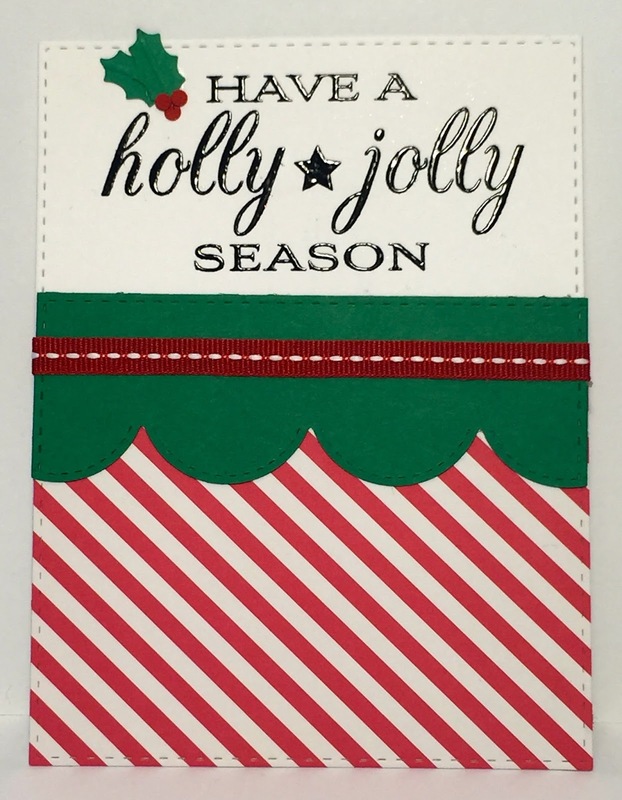 To make the card I used the MFT stitched scalloped border dies (I love these!) and the Green Pastures stamp set illustrated by Torico. I paper pieced her clothes (and the chick) to make sure that the shades matched. Matching saturated shades of the primary colors can be HARD. That's it for me. Thanks for stopping by and taking a peek! My Favorite Things did another session of summer school last week, and it was all about color. I'm actually teaching summer school right now, so I haven't had as much time as I would have liked to play along. However, I did manage to squeeze in a little crafty time this afternoon, so I used the lesson on secondary colors. Secondary colors (purple, green, and orange) are are produced when you mix the primary colors together (red, yellow, and blue--BTW, was I the only one who learned a song about the primary colors as a child?? That song has been stuck in my head all week!--The primary colors are 1..2..3...Red...Yellow...and...Blue...). Here is my take on the color challenge. 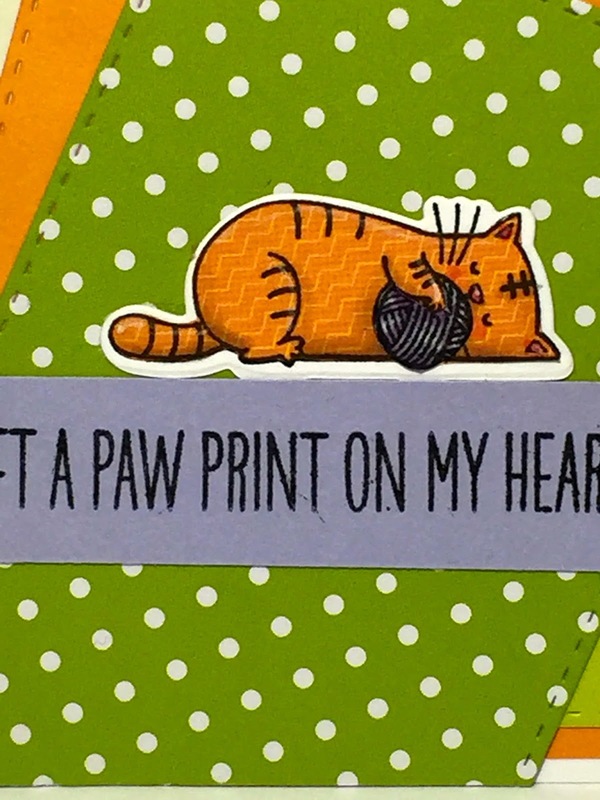 I paper pieced the kitty with a small scale yellow and orange chevron so it would look like it was an orange tabby. Here's a little close-up, so you can see it. Also, I don't know why that purple is photographing so blue. In real life it looks purple. Popping in with a quick post. 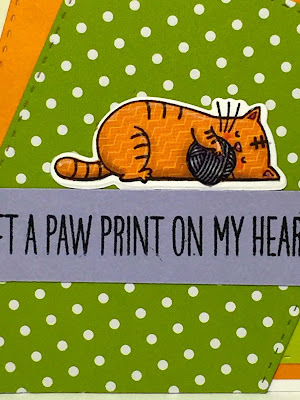 This is my second entry in the Simon Says Stamp Challenge. The theme is "Going Dotty." This is the perfect challenge for me--I love polka dots! 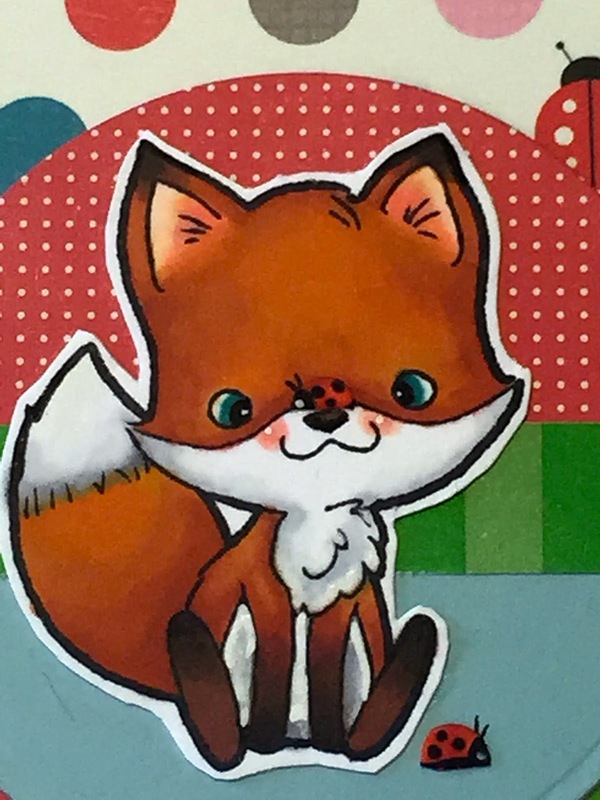 The fox stamp is from Some Odd Girl--What a cutie pie! I thought he looked kind of cross eyed, so I put a little lady bug on his nose to complete the effect. 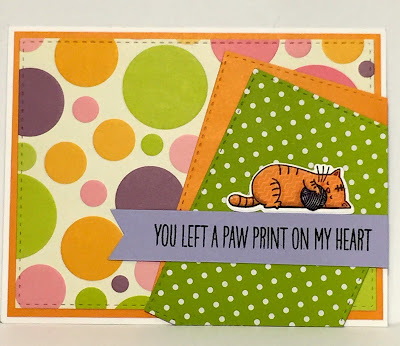 The "hi" die is from MFT, and the "there" stamp is from WPlus9.